I had the privilege to attend the 2013 Ligonier Conference in Orlando, Florida, from Thursday February 21 to Saturday February 23 – and a couple of days on either side to get settled and unsettled again. The concept of attending this conference and spending a few days in Florida came from the consistory, and herewith I want to express publicly our deep gratitude for this opportunity. A chance to be refreshed, encouraged, and fed in the wealth of the Scriptures by men very much in step with developments in our contemporary culture – yes, it was a privilege, and every moment worth it. Ligonier Ministries is run by R.C. Sproul Sr., a man well versed in theology and church history. He’s a man of imposing personality, and he deliberately uses this strength of character to advance reformed theology throughout North America. He does not quibble on the authority and clarity of Scripture, and so unpacks and expounds what Scripture says in its honest and plain meaning – and that’s to say that what he says from out of Scripture is distinctly reformed. Yes, he –like everybody else on this planet− has his weaknesses, so that he is certainly not above criticism. But there is no question that he pours his heart and his energy into the service of his Lord and Savior Jesus Christ. This is the man (together with his team) who cobbled together the topics intended for this conference and decided upon the speakers who should address the various topics. Men of big renown in America’s neo-Calvinist resurgence joined Sproul Sr. behind the lectern: Alistair Begg from Parkside Church in Cleveland (one can hear him on local radio); Steve Lawson from Christ Fellowship Baptist Church in Mobile, Alabama; Cal Thomas of Fox News fame; R.C. Sproul Jr.; Sinclair Ferguson of First Presbyterian Church in Columbia, S.C. and professor of systematic theology at Westminster Theological Seminary; and even the famed apologist Ravi Zacharias. Some of these men are Presbyterian, others are (reformed) Baptists – and yes, from time to time their differences bubbled to the surface. But even with the odd unsavory element, the dishes served up by this smorgasbord of speakers were all very edifying and encouraging. We were treated to talks on justification (by faith alone, through grace alone, in Christ alone), the authority of Scripture, the need to preach the Word, what mercy looks like, how the Lord is building His church, why one can be confident of persevering in an age of apostasy, and more. 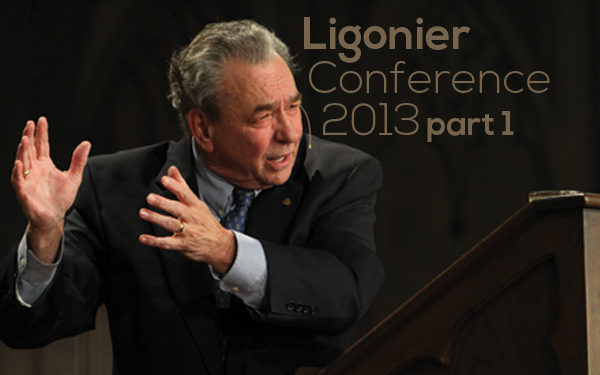 Those who were interested in hearing what was said need but go to the Ligonier Ministries website and follow the links. The theme of the conference was No Compromise. The speakers one after the other recognized that God’s Word and service are being much marginalized in our present North American culture, and so the temptation is real to try to make the gospel less offensive. In that context we were repeatedly told that there is neither need nor place for compromise. Christ, after all, is Sovereign Lord over today’s world –important ultimately is not who is ‘in’ the White House, but who is ‘over’ the White House− and we need in no way to be ashamed of that reality. On the contrary, precisely because Christ is sovereign we can and must stand tall on the faith once revealed to us – even if we loose much in this life in the process. It is not for nothing, we were reminded, that early churches were built in the shape of a cross – and the reason was not simply that Christ crucified is the message proclaimed in church, but the reason is also that the life of those who enter the church is a constant suffering and crucifixion; the hatred of the world is a stark reality for those who love the Lord Jesus Christ. This, however, is no reason for discouragement (I was reminded), for Christ has overcome the world. Yes, very encouraging messages indeed.